WIDE OPEN AND READY FOR BUSINESS! On a drive through the southern Nevada deserts, people are often mesmerized by the expanse of seemingly lifeless landscape. It can be hard to believe that anything can survive the test of time in such a landscape--But Beatty Nevada has done just that. This small town has survived when larger towns such as nearby Rhyolite, which was expected to become a major metropolis in the early years of 1900, could not. Economic downturns over the last 15 years, that dwindled the size of the community, are beginning to correct themselves with new events creating a great deal of interest in the town. A friendly oasis on the seemingly endless Hwy 95, Beatty is primed for expansion. A new Community Management plan is being developed to facilitate the opening of over 5,000 acres of BLM land to development. As a central tourism gateway, Beatty has the economic advantage of being far enough away from the expensive land of Las Vegas to make development more cost effective, yet close enough for worldwide shipping of marketable goods. 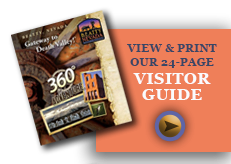 With the heavily traveled state highway traversing town and Death Valley a few short miles away, Beatty is also a great bet for tourism based businesses. Nevada's pro-business right-to-work laws and favorable tax structure (one of the lowest taxed states in the nation. There is no estate, gift or inheritance taxes, no state income tax, no franchise or unitary tax and no personal property or inventory tax) make it an ideal place to locate your business. We have over 300 days of sunshine a year, with warm, dry days in spring, summer and fall and crisp, sunny winters.